It's a Very Merry Muppet Christmas Appreciation Thread! Discussion in 'Classic Muppets' started by peyjenk, Dec 11, 2008. I watched It's a Very Merry Muppet Christmas Movie the other day and was shocked. Simply shocked. This? This is the movie that has been so maligned on MC? This is the movie that made me wince and cringe when I watched it last? This is the movie that Muppet fans were most embarrassed of (before MWoO, of course)? It was wonderful! I don't know how one movie could have changed so much in just one year, but IaVMMCM was so much more enjoyable this time around. I don't know why. But whatever the case, it made me think. Why do we trash this one so much? -Joan Cusack as Rachel Bitterman. I had been waiting for the Muppets to face a female villain ever since Muppets From Space, and this movie finally gave it to us. She was a great, classic Muppet villain in the vein of Doc Hopper and Nicky Holiday (and lots better than K. Edgar Singer). Cusack is wonderful at interacting with the Muppets, and her performance is even better when you consider that almost every scene is either solo or opposite puppets. -Kermit as a human being. No sillies, I don't mean literally. I mean when he loses his cool and starts shouting and wishing he had never been born (always wondered, shouldn't he say "I wish I had never been spawned"?). Now, you may remember that he occasionally lost his cool on TMS, but those were usually temporary moments played for comedy. In this movie, though, Kermit gets to let loose and show his full range of emotion and yell at people who don't deserve it and say rash, uncaring things. Of course, I don't condone or appreciate that when people do it in real life, but it really shows the pressure he's under and the love he feels for his friends. All in all, I think it rounds out his character very nicely and shows that even a patient and understanding guy like Kermit can have a terrible, rotten, no good day... and then come out better on the other side. -The world without Kermit. It's a horrible, horrible place, but it's nice to know what we've ben spared. I didn't like the jaded and mean spirited jokes that occasionally popped up in this show. But I did like the moment when Kermit realized he never should have wished he was never born, that was very inspirational. At the risk of derailing the thread, what do you mean "jaded and mean spirited jokes"? People keep referencing those, but I'm still not exactly sure what they mean. Yes, I know the movie is far from perfect, but I do believe it captures more of the Muppet awesomeness than we have generally given it credit for. Hmm well honestly I don't want to derail it either. It's great that you decided you like it better now and I don't want to get into any negativity. I feel the same way. I'm sorry if I seemed defensive in my last post. No you didn't seem defensive, you wanted to stand up for a show you liked. I actually liked Whoopi's moments better than I thought I would. I never minded the idea of a female God or anything, just that having a big celeb play God seemed odd. But she was a nice interpretation to me. When it came out in 2002 I posted this brief review. I actually remember giving it an A-, but I still feel the solid B I actually gave still holds true. It was a little too somber and that threw the usual Muppety feeling off-balance. There were not enough musical numbers - I wanted to stay with the Moulin Scrooge show and backstage zaniness and it left all too soon. It was unevenly paced. Muppets usually have more of a kick to them than in this special. They also needed to be more inclusive of younger audience members that seemed to drift off or become too disturbed by the goings on. The classic setting, the character performances, the character inclusions, some of the story, the alternate universe and that it wasn't just a kid's special. I liked the humor. Sure it was crass in bits. It is my belief that those bits just needed to be balanced with other shades of humor. It really appeared that the Muppets were back, just not given enough to do or the camera didn't follow the action fans wanted to see the most. This new direction and special is leaps and bounds over what VMX and OZ contributed. It appears to have all the Muppety craziness classically orchestrated as if by Jim. I found a lot of the Jim spirit missing in VMX and that's why I think it got a lot of grief. Personally, I like this movie for various reasons. I have my problems with it too, but the good outweighs the bad. It took a few viewings for it to really grow on me, but it did. If only because it had the Muppets return to a theater environment and they really work well there. There were some jokes that while not quite jaded or mean spirited, just didn't go well with the Muppets and honestly, there are quite a few things that just seem dated.... And not in a "Oh, its dated but I can enjoy it anyway." It was more of a "Oh, this is hip and current so let's throw it in there." Ms. Bitterman was... and for that matter, most of the human characters were a mixed bag. She was a fun character but just TOO evil for the point if being evil and greed. It's as though they were trying too hard to make people hate her. At least with Doc Hopper, he was somewhat likeable, even if he was somewhat exagerated in his desires. I thought Daniel was a sweet character though and I liked his interactions with Kermit. I liked Gonzo's role as a sort of second in command character. And of course, it was great to see Scooter in a role. I thought it was sweet how he was the first character after Fozzie's speech to say that he would forego his salary. He's come a long way since the early Muppet Show days when he was more interested in money and taking advantage of the fact "his uncle owned the theater." And though I think some things could have been handled differently, I do like the refrences to It's a Wonderful Life. And the Kermit statue (or rather, what it said) was very nice. And I'm glad this thread was started. I was thinking about starting one about this movie myself. I've heard mized things about this special. Can anybody go into great detail for me in what was wrong or right with it? I loved this movie when I first saw it back in 2002 the night it aired, and I love it even more now. I was honestly suprised to see so much dislike for it, I thought it was excellent. The humor was great, and the emotion (and wonderfully performed range of emotion for the key characters) was superb! My only problem was the the part at DOT...I'm STILL trying to figure out WHY Sam the Eagle of all people would be there, and why Robin (still a child in this movie, I'm assuming, although he could be a few years older than he was originally...but still a child) would be working at such a place. I've come up with explainations in my head as to how and why Scooter, Bunsen and Beaker, Johnny, and the two critics would be there since they're not far fetched at all...but I just couldn't explain a reason for Sam and Robin. I found Piggy and Gonzo's situations to be believable, and also both sad and touching (Piggy's scene proved that Kermit really loves her, and Gonzo's was just plain depressing *hugs Gonzo* but well done). I'm rambling on too much, sorry! Back to the point, I loved this movie. I loved the emotion (one heck of a performance by Steve in this one, seeing Kermit at his worst is not something I'll forget...it was wonderfully done, such great range! 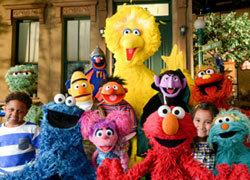 ), I loved the humor, I loved the singing and the new original song, it was just what I like to see from the Muppets! I found a lot of the Jim spirit missing in VMX and that's why I think it got a lot of grief. I couldn't agree more. There has been a sort of void left by Jim that seems to have gotten better just recently. The Muppets have never been given such a chance to grow and thrive as they have now. MCC is rather gloomy. I like it, but favor MTI. The reason I liked VMX so much is that it brought the characters back to the show and the theater. They weren't playing characters anymore. I agree that they just aren't the same, but I don't think that stops them for being decent movies in their own right. It's like comparing apples and oranges. They're both fruit, but both have different flavors. I know its hard... impossible, even for one to judge Jim-era Muppet projects to more current Muppet projects, but I try to look at each with different eyes. Not to mention the fact that the muppets were actually the stars of VMC. I really do like MTI because they really had a great zaniness level the entire movie through. MCC basically turned into (as I've said a hundredy billion times by now) A Michael Cain Christmas Carol with special guest stars The Muppets. Especially the Ghost of Christmas past segments... other than Fozziwig's party (the only thing I feel was Muppety in the entire film) we basically just had long segments of Belle singing to Scrooge and stuff like that. I DID love the Ghost of Christmas Present, though. BUT it was back to the funny, goofy, wacky Muppets that were missing in MCC. We had some nice gags (the Chef and Beaker incoherently arguing with each other) and a great call back to the first movie. I think it works better as a TV special than a true movie, myself. The only negative thing I can say about this movie is the lack of songs. Otherwise I loved it all around! It was a little too somber and that threw the usual Muppety feeling off-balance. Yes, it was somber (God knows I have a hard time writing "Muppety" fics). However, to be fair, they were going for the "It's a Wonderful Life" theme, and that movie ain't exactly a comedy. They also needed to be more inclusive of younger audience members that seemed to drift off or become too disturbed by the goings on. Ms. Bitterman was... and for that matter, most of the human characters were a mixed bag. She was a fun character but just TOO evil for the point if being evil and greed. It's as though they were trying too hard to make people hate her. I agree she should have been given some sort of REASON to be so darn hateful. However, aside from that being fanfic fodder, they were probably trying to avoid the whole "villain didn't get that toy when he was a kid and now he's gonna destroy Xmas" thing that's far too cliche on Xmas movies. I thought Daniel was a sweet character though and I liked his interactions with Kermit. So did I, though he ran the risk of having the exact opposite problem Bitterman had. He was almost TOO sweet. However, you need someone like that so that Kermit's outburst can gain even more intensity. I thought it was sweet how he was the first character after Fozzie's speech to say that he would forego his salary. He's come a long way since the early Muppet Show days when he was more interested in money and taking advantage of the fact "his uncle owned the theater." He was the first to feel ashamed after Fozzie's speech in the Great Muppet Caper, if I recall. Can anybody go into great detail for me in what was wrong or right with it? You'd get a million answers. 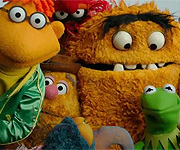 The general theme seems to be it's too somber (and/or creepy) for the Muppets. It's usual to think that ultra-conservatives secretly harbor a desire to do/believe the very things they say they hate. That one's harder. However, I don't see Bitterman caring all that much about child labor laws. There has been a sort of void left by Jim that seems to have gotten better just recently. I honestly think that had Jim Henson lived a bit longer, we would have seen the same thing. Dark Crystal and Labyrinth's fates depressed the heck out of him, from what I've read. Even though I have learned to love Steve's Kermit, Kermit is still kinda portrayed as Jim's alter-ego ... and the Boss had had the wind knocked out of his sails. Which is rather weird to watch now that he's gone. Though I personally thought it was a hilarious part of the whole Fozzie gag. One can technically appreciate something and have something to say a little more in-depth than "OH,WOWILOVEITICAN'TSTANDTHEHATERS." Despite the lack of a backstory, Bitterman is the best villain since Nicky. And that is a deep compliment from me, since I loved him more than Doc Hopper. It's a shame she was only toying with Pepe, because I actually liked the idea that Nicky actually loved Piggy. That, and I love the fanfic potential in her. Where people see little characterization, I see fanfic potential. The theater. It looked very impressive and was more ... 3D ... and yet rather dead-on. And quite frankly, the Muppets tried the whole TV thing, but Dinosaurs did video gags better. Muppets belong in the theater. All the references to a WHOLE lot of Muppet stuff, including a LOT of GMC ones, even if they were subtle. The AU. Yes, it was creepy as all get out. However, we so rarely see other characters outside of Kermit's context, so it was nice (though creepy) to see sides of them that I guess existed all the time but what was flat out mentioned here. Whoopi. Not exactly Morgan Freeman or George Burns, but I'll take her. I could have done without a reference to a criticized joke she had made at the president's expense (though I'm not exactly a fan of his). However, I liked her general attitude and the fact that after all that complaining to Daniel about not wanting to help Kermit, she was actually helping him all along in secret. Kermit, apparently, wasn't the only one who needed to grow a spine. Dagobah. Cheap-looking (oh, how I miss the constant SW references in Muppet Babies) but funny. Pepe. I hadn't watched a lot of Muppet's Tonight, so this was the first real exposure I had to him. I am in love. He first struck me as what Rizzo used to be in the 80s, or even a more intense Rizzo, but I can appreciate him now as his own character. He's the Bugs Bunny of the group, easily attracted by temptation but more than able to outwit his opponents at the last moment if you cross him. I'm a big admirer of quick thinkers. Fozzie. I bet some people might use his "chase scene" as an example of the mean-spiritedness, but really, Fozzie's always suffered from low self-esteem. It's really unfortunate, because Fozzie is incredibly funny when he's not trying too hard. He is just natural comedy. I think that's why AU Fozzie ends up a pick-pocket. It represents more concretely his dependence on others to survive because he doesn't see himself as worthy of having his own life. That's why he basically uses Kermit as a crutch all through the years. He's a great character opposite Kermit, but he doesn't NEED Kermit actually. He thinks he does, but he doesn't. I would say Club Dot is a negative, but it's hard for me to gripe about that and the Poppyfields thing in Oz because the Mayhem has always been the counter-culture thing and it's inaccurate to say that Scooter cage-dancing isn't Jim at all. If it had been Janice, I bet no one would have said a thing, because that would actually be in-character for her. And Rizzo threatened by Fear Factor can almost thank Jim, who on youtube seems to predict reality TV. It took me a couple of viewings to really get into it, but I liked it from the first viewing, despite my jaw dropping a few times. Oh I never minded it when the Muppets did risque humor. But there are different levels, that's all. That's a good point, both are quite somber stories in order to make the ending more touching. Christmas isn't about being blindly cheerful, but perservering against problems as well. I think the special does that well. And I agree, as long as it's civil, there's nothing wrong with constructive comments about the show. Discussion makes for more interesting content. I agree with most of that. I loved VMX, but my main gripe is the lack of musical numbers. The stage was set and the whole project was ripe for it but we got very little of that. I can't imagine what they were thinking. To me, though, Oz's Poppyfields is worse than Club Dot because at least Dot was JUST a club. It didn't have (and I concede I'm naive with drug references) the same connotations that I KNOW Poppyfields had. I know what poppies are for. I guess the dot could be some 60s LSD reference, but that's a stretch, considering it just looks like a typical nightclub/bar.